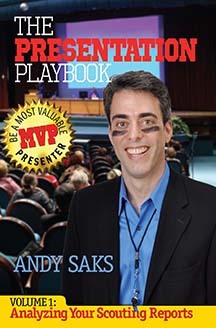 Las Vegas, NV — The trade show industry’s marquee event has booked Spark keynote speaker Andy Saks to give a second seminar, this one on PowerPoint design. Saks will deliver Spark’s PowerPoint training seminar “Bulletproof Slideshows: Great presentation slides within and beyond PowerPoint” at the Exhibitor Show 2015. The Exhibitor Show will run at the Mandalay Bay Convention Center in Las Vegas from March 1-5, 2015. It features North America’s largest exhibition of trade show and event products and services, and over 180 comprehensive sessions and workshops. The seminar will include a slideshow, workbook, discussion, sample PowerPoint decks, and critiques of participant PowerPoint presentations. Saks will also facilitate a Peer2Peer Roundtable discussion at Exhibitor Live! on related presentation skills, and be featured in a signing session for his book, The Presentation Playbook: Be a Most Valuable Presenter. Spark Presentations is a private company founded in 1998 that provides presentation skills training and speech coaching for executives, salespeople, marketers and others, plus booth staff training for trade show exhibitors. Spark also books professional presenters to represent its clients at high-profile events as keynote speakers, trade show booth presenters, masters of ceremonies (emcees) and live auctioneers.